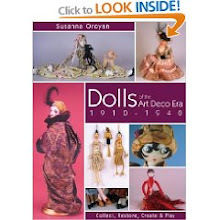 Here is a link to see all the wonderful dolls as they are set up at the show. Click on the picture of Tine Kamberbeeks fairy in the block that says World Ningyo Exibition. It will take you to the show page. 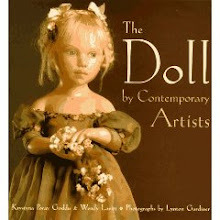 There are two pages of doll photos. To get to the second page click on the short brown sidebar at the bottom of the page on the right (not on the long brown one), or, on the short brown side bar top right in the picture of the blue brick window that says Maruzen. 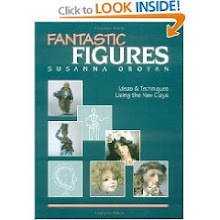 There are some pretty fantastic dolls! My little Victoria looks so lonely on the table by herself!! I only had time to make the one doll, but she has her little vampire dolly to keep her company! I love all the wonderful Japanese ball jointed dolls in the show! Victoria Vampire, My doll for the Japan show! Well, this must be my year as caretaker, as thats all I seem to be doing since the beginning of this year! It leaves me precious little time to do anything else, and I've sorely neglected my poor little blog. Between careing for my 84 year young mother who had a stroke after christmas to my husband who recently had a new bionic knee replacement. I'm a bit burnt out!! Plus trying to finish some dolls that were promised last year..(thank you to those who patiently waited in the wings while I dealt with life)! 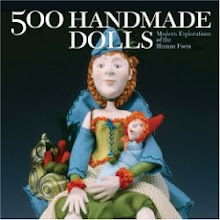 And..trying to get my doll for the Japan show finished and mailed so it would arrive in time.! Yeah..I am happy to say it did arrive safely and all is well..for this moment! LOl! Here is a link to the show in Japan. There are some wonderful artists included and I am honored to be among them. "Little Victoria wanders alone at night looking for someone tasty to bite"! She measures 12" tall and wears antique fabrics and carries her little ghost dolly along on her outings. If you might be interested in having her come to haunt your house, email me at faeries16@hotmailcom and I can give you the contact info. In the meantime Ms "P" has been very quite..it makes me really nervous, especially when the lights flicker and I hear crackling lightening like noises and hidious laughter coming from the back room!!!! I am lighting my religious candles covering myself with protective oils, and calling in all protective saints and any one else that can bring protective energies to prepare me for what MS "P" might be boiling up in her little dark corner of the room....BE AFRAID...BE VERY AFRAID!!! This is what happens when she does not get the attention she requires..does anyone have a spare suit of armour???? I love great books! Especially ones that have lots of wonderful inspiring photos! 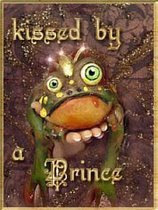 I recently ran across such a magical book, thanks to a post by artist Extroidnare Joanna Thomas. 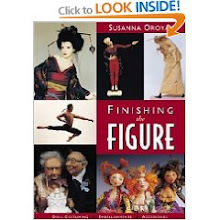 This is a Fabulous French book put together by Aude Berger. There are beautiful large photos of works by 13 doll artists. 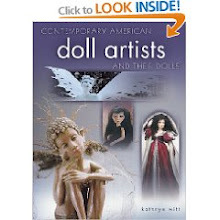 I was pleased to see dolls of some artists that I had not previously known. Some of the artists included are Wendy Froud, Tine Kamerbeek,Virginie Ropars Veronique Jacquelin, Heloise, and Bets and Amy Van Boxel. The book is in French, but Aude has had some of the writing translated into English. She is looking for someone who can help her translate the rest of the book from French into English. If anyone can help or knows of someone who can translate, please contact Aude at oo.berger@laposte.net. You can e-mail Aude if your interested in purchasing the book, she does speak English. 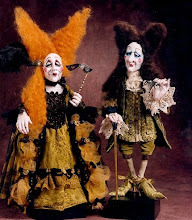 What I read of the translated work is charming and as beautiful as the dolls. Aude has an enchanting style of writing like reading a fairytale. Thank you Aude for creating such a wonderful book for us to see!